More consumers are resisting the temptation to spend their refund from Uncle Sam. 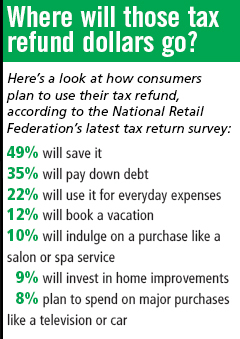 Of the two-thirds of consumers expecting a tax refund this season, 49 percent plan to put the money into savings—the highest level in the 12-year history of the National Retail Federation’s annual tax return survey. In addition, 35 percent will use the money to pay down debt. An Individual Retirement Account (IRA) is a simple way to save for retirement. And it’s not too late to contribute to a Traditional or Roth IRA for the 2016 tax year. Qualified individuals can make contributions until April 18, 2017. For more investment direction, contact Dupaco Financial Services. With Dupaco’s Holiday Club, you can systematically save for the giving season all year long. At the end of October, the balance will be deposited into your checking account (or your savings account if you do not have a Dupaco checking account). With You Name It Savings Accounts, you can name them whatever you wish, and systematically save for your needs or wants. These accounts can be a great tool for investing in your future, which might include further education or home improvement projects to increase your home’s value, Hilkin says. Whether you establish a 529 college savings plan or open a savings account, it’s never too early to begin setting aside money for your children, Hilkin says. Please provide your information. Name and email address are required. Email address will not be displayed with the comment. Thank you. Your comment is being reviewed and if approved, will be posted shortly. Will you be able to retire debt-free? High or low deductible: Which is the right fit? Is the IRS really calling you? How do the federal interest rate hikes impact you? Why does the Internet of Things matter to you? Did Dupaco really mail that to you? Are you a victim of identity theft? Great Credit Race: How will it finish? Have you reviewed your life insurance lately? What if the unthinkable happened? Debt consolidation: Is it right for you? Where do you seek financial advice? How do you relate to money? Will I outlive my retirement savings? Don't have an estate plan in place? Are you prepared for financial hard times? You just wrote your will. Now what? In the market for a new car? Is it time to refinance your mortgage? Fed rate announcement: how does it impact you? Midwest winters bite back: Are you prepared? Can you spot a skimmer? Insurance: When's the last time you perused your policy? What will you do with your refund from Uncle Sam? Cybersecurity: Can you spot a fake website? Vintage windows: repair or replace? Why support the credit union difference? Vehicle leasing: right for you? Long-term care: What's the next step? A fee for paying back your lender? Would you like a receipt with that? A gold mine in your jewelry box? National Preparedness Month: Can your finances weather a disaster? National Preparedness Month: Would you be ready if disaster struck? Making a will: What are we waiting for? Buying in bulk: bargain or bust? Honing in: What counts in card offers and fine print? Counterfeit bills: where does the buck stop? New credit card rules: what's in it for you? Have an insurance claim? Watch your language. Are There Any Deals Left on New Cars? Cash For Clunkers Ending, Consumers Reminded to "Buy Cautiously"
Looking for a Chihuahua? You've come to the right place.